Cappie: Ready! Hut! Ok! All right. Cheer Coach: Get up there! 5, 6, 7, 8. Come on! Don't break! 5, 6, 7, 8. 1, 2, 3, 4, 5, 6, 7, 8. Come on. Good! Good. Smile! Look up. Come on. Smile! Cheerleader: There's someone out there! Cheerleader: There he is! I think he's got a gun or something. There's something extraordinary about "Lucas"; something that makes it impossible for us to reject it. We have always watched movies like "Lucas" along the ages, I have watched plenty of movies like it; and have disliked them all. Not that "Lucas" is great, but you know what I say about 'Love Actually"? If you express it with this film, "Lucas" is good as a movie, but almost brilliant as a family inspirational picture. An old tale of a boy who is not accepted in his everyday environment and tries to live with it. 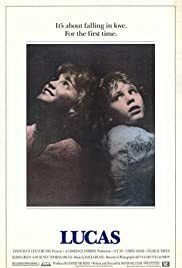 The hero of this tale is the special Lucas, played by Corey Haim as a boy who is definitely stranger and more intelligent than the rest of his companions; it's something you notice immediately. Gorgeous), who obviously likes him and follows his look while he is searching for Maggie on the first day of classes. The movie understands the characters so well that it turned out the way I said, of course. That's not the kind of phrase you'd commonly listen a 13-year old say, even less on a film. That's the way Seltzer shapes his characters, in a way that we believe everything they declare and in a way that the only thing that becomes predictable in the movie is the storyline itself. So classic: the simple edition (Priscilla Nedd-Friendly, "Down to Earth"), the touchy score (Dave Grusin, "The Goonies", "Hope Floats", "Selena"). What I'm trying to say is that, to Seltzer, is all about the movie. The actors don't show off, Corey Haim is the hero but not the star. It's about the movie; a piece with an absolutely clichéd resolution that we find inspiring and therefore embrace.